They say that just showing up is half of the battle. Unfortunately, many people are making mistakes in the gym that are preventing them from reaching their goals and winning the war. Here are 10 common workout mistakes that people make in the gym that hinder your gains. Over-involving accessory or stabilizing muscle groups. This is when you don’t keep tension on targeted muscle groups because other muscles are supporting the movement than is intended. Some common examples are: (1) arching your back during a curl, (2) flexing the thoracic spine and over-involving traps on pulling movements, and (3) over-rotating your shoulder during pressing movements and getting too much help from the anterior delt. Not optimizing time under tension. Time under tension is the ultimate precursor to muscular hypertrophy. If you do not optimize it by using proper form, you are missing out on muscle growth. This can happen by doing the exercise too fast and uncontrolled or failing to maintain a braced neutral core and generating proper torque. Not optimizing time under tension is common during squats when the knees turn inward on the back rounds. 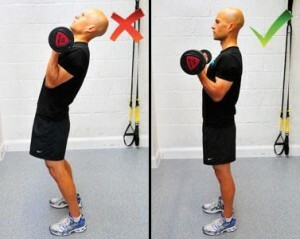 Also, during bench presses when shoulders fail to maintain a neutral position causing your elbows flare out. Using limited range of motion. When you don’t use a full range of motion, you will not achieve optimum muscular contraction. While partial repetitions can be utilized sparingly as an intensity technique, they shouldn’t be done for every exercise. At the gym, your goal is to strengthen your body, not your ego. Don’t try to impress that cute girl by lifting more weight than you can handle – risking injury or sacrificing your form. Stick to your day’s regimen. If it’s supposed to be a light day of lifting to recover from the previous day’s hard lifting, you must follow the set program as intended even if you see someone half your size lifting similar weights. Focus. You must be focused on your goals and realize you are not competing with anyone other than yourself. Concentrate on goals. Lifting with ego will get you thrown off track and extend the time required to accomplish your goals. A person may appear to be in shape, but it is likely he will eventually incur an injury because of bad form. Also, it’s possible to have a decent body through good genetics, eating right, and working hard in the gym – regardless of whether or not he is using optimal form. Although the exercise and techniques he’s doing may be ideal for his goals and current fitness – these methods may not be the best choice for you. If you are building a foundation, you need to focus on basic compound movements with the goal of gaining strength, not doing massive stripsets/supersets to force some adaptive hypertrophy. 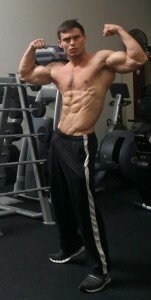 You can make faster progress by simplifying and working your select muscle groups with less volume and more frequency. The gym is not a social event. You need tunnel-like vision and high mental intensity when working out if you are looking to get muscular and lean. If you are not sweating or not in pain, you are not pushing yourself to the lengths required to stimulate any real change. The body only adapts when it’s forced to do so. Just walking into the gym won’t make that happen. It’s how you utilize gym time that dictates how your body will change. Using the same weight for the last year. Taking extended rests to chit chat. Or, day dreaming during your actual exercises. It’s doubtful your body will respond with any adaptations because it’s already capable of handling the stress you place on it. Don’t waste valuable time in the gym just going through the motions. Try Sheer Strength Labs Pre-Workout to reach a level of energy and intensity in the gym that you have not experienced before. If you don’t think it works for ya – you can get your money back because that’s how confident Sheer Strength Labs Pre-Workout is that its ingredient profile will enable you to have the best workouts of your life. You can show up to the gym, workout hard with great form, and still not make the gains you want if you aren’t doing an individualized workout program tailored for your body and goals. Don’t select a workout program based solely on what others are doing or what a magazine suggests. It’s important to program for your specific muscular imbalances and weak points. Sheer Strength offers you man solutions for the best results from your individualized workouts. For instance, you may be following a routine for bigger pecs. However, if you remain in an internally rotated or protracted shoulder position, your moves are compounding imbalances. Instead, let Sheer Strength address your postural imbalances as you incorporate a higher ratio of pulling exercises to pressing movements during your routine. Another example would be someone following an exercise program that may be too advanced for him or a regimen that contains too much volume for his current fitness level. If you are trying to follow a professional bodybuilder’s workout but are not anywhere near that level, you will progress slower than if you were doing a program tailored to your level and goals. While the majority of people are probably undertraining in the gym, there are some who are limiting their gains by overtraining. If you are spending more than 90 minutes in the gym doing a hard workout, you will almost certainly reach the point of protein turnover and start breaking down lean muscle. This is especially true if calories are being restricted. Supplementing with Sheer Strength Labs Testosterone can aid you in preserving your lean muscle mass. When your body is being pushed to the limits and begins to search for amino acids to use as fuel, you don’t want the source to be from your lean muscle tissue. Sheer Strength Thermogenic will provide the support necessary to keep you burning fat while sparing your muscle. The all natural ingredients ensure RELIABLE results, because you definitely want to know what you’re putting into your body. Remember, more is not always better and too much volume can also begin to negatively affect cortisol levels that will encourage fat storage and limit muscular gains. There’s nothing wrong with using extreme effort and mental intensity when exercising – but, you must use the appropriate amount of volume with it – and NEVER push yourself through joint or muscular pain. This is very common for beginners who may not yet be comfortable using free weights. While free weights may be more unstable and uncomfortable at first, these should make up the bulk of your routine. Free weights force you to engage and stabilize your core muscles. The caloric burn on machine weights is much lower because the machine stabilizes for you. To further tax your muscles once they have been fatigued and stability could be sacrificed. Some people also elect to gravitate toward weight machines because they feel pain when using free weights. 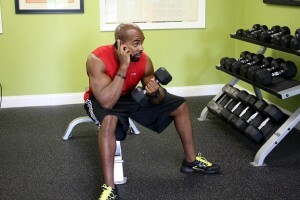 It’s never a good idea to work around an injury by avoiding what causes you to be aware of it – that is, free weights. You must address the underlying cause of your pain source in order to ensure you don’t have limitations in the gym or the real world. Some people never deadlift in order to avoid injury. Are you using machine-implemented back extensions and leg presses to avoid back injury from deadlifts? Eventually, the real world will put you in a situation where you have to perform a deadlift such as picking up a large bag of dog food or perhaps moving furniture. If your body is not properly trained to deadlift in the gym, you have a much higher risk of injuring yourself in one of life’s daily tasks. There is a time and place to use a lifting belt – like when doing a max deadlift or three-rep squat – not with light dumbbell curls or leg extensions. It is better not to use a lifting belt throughout your entire routine. Doing so takes away from your ability to effectively engage and stabilize your core in a braced neutral position. Develop and maintain your belt so you can keep your spine neutral by engaging your transverse abdominal muscles and internal/external obliques. Another common practice we discourage is reliance on somewhat heavy straps or pulls. Use of straps will take away from your grip strength and hamper gains you could make in your forearms. Use straps only when approaching fatigue, failure, or going very heavy. Workout gear can help you push beyond your normal limits, but will eventually be a hindrance and crutch if overused. 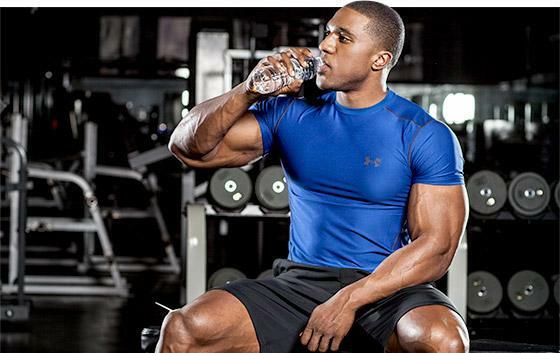 Your body’s cells take time to absorb water intake and replenish your muscle function. Hydration must be maintained when you are not working out – as well as during your workout – for peak performance and maximum gains. It is vital to include a warm-up prior to your workout. A warm-up routine should include mobility techniques for your specific issues and the workout you are about to perform. This can be accomplished through a variety of stretches and foam rolling techniques. For example, someone with tight glutes and hamstrings would want to roll and stretch those areas prior to doing squats. While a general warm-up is fine, always make sure to do a few lighter sets of the first couple exercises you perform. This will increase your joints range of motion, form neurological connections, and help you perform the movement more efficiently. Many people spend hours in the gym grunting and sweating without bothering to spend an essential 10 minutes stretching in order to prevent injuries and imbalances. Time is valuable, and you can’t afford to waste it in the gym when you are supposed to be making progress. Make the most out your time by utilizing supplements that give you an edge – like Sheer Strength Labs Pre-Workout – to reach new levels of focus and intensity in the gym. And, don’t forget Sheer Strength BCAA’s to prevent muscle catabolism during those intense workouts. If you avoid these 10 common mistakes that are proven to hinder gains. Every moment you spend in the weight room will take you a little bit closer to your goals. The post 10 Workout Mistakes to Avoid Making in the Gym appeared first on .